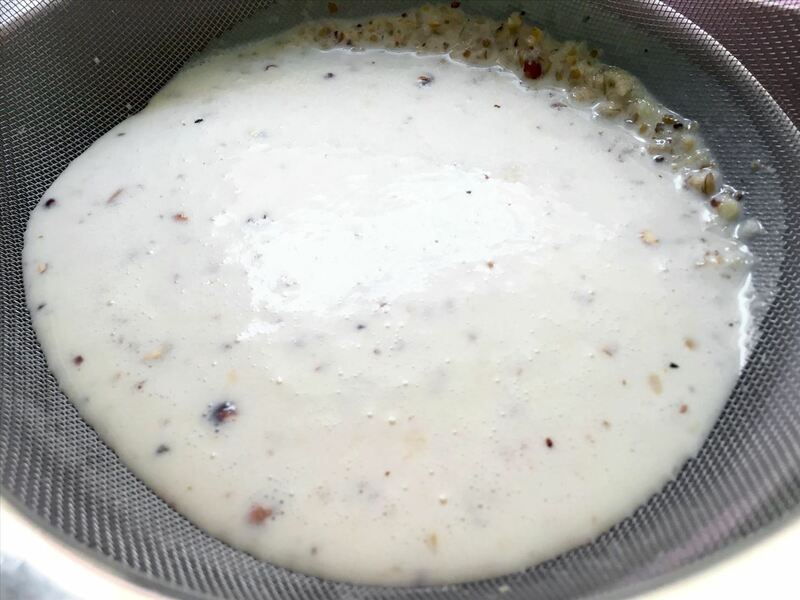 Sometimes, you come across a recipe or a food hack and think, "That is the weirdest thing I have ever heard of; who would make that?" That was my initial reaction when I read Food52's piece about popcorn milkshakes. 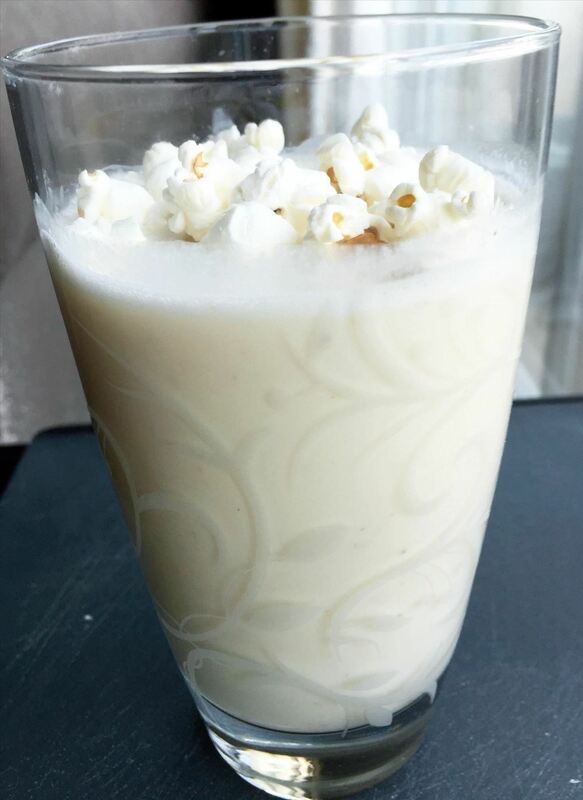 But after a bit more consideration, I decided that popcorn is good and milkshakes are good, and the salty-sweet flavor combo is never a bad thing, so why not give it a go. 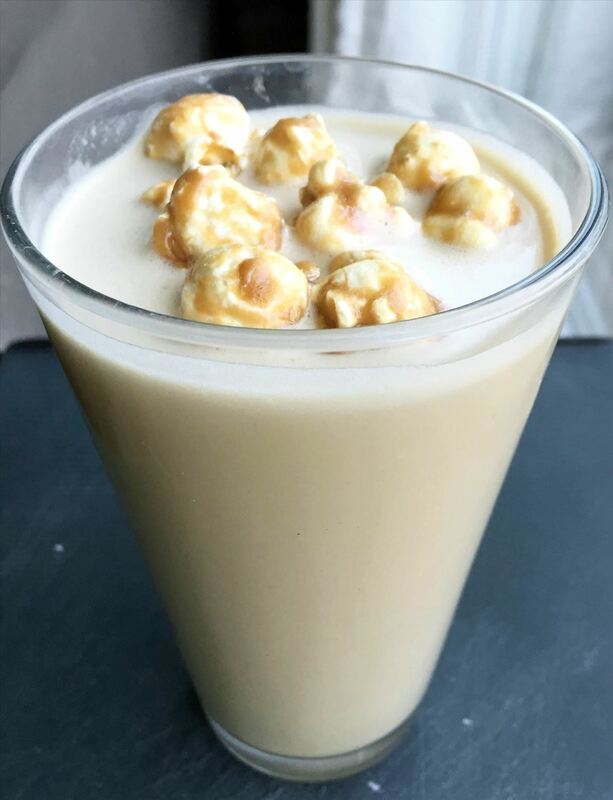 In order to put my own stamp on this curious concoction, I decided to only make a half-batch of "regular" popcorn milkshakes and create another half-batch of caramel corn ones (Sabrina from Dinner, Then Dessert has a good recipe for caramel popcorn if you want to try making it from scratch). The first step is to make popcorn, and I made half what the recipe called for since I was also making the caramel corn milkshake. I popped the corn in a pot big enough to use for the rest of the preparation. After the corn had popped, I poured in half of the half-and-half, added just over 1/3 cup of granulated sugar, and brought the whole thing to a boil. I also added in 1 Tbsp. of salt, the maximum that Sarah at Food52 recommends. I absolutely love salt, but this was too much. If you make this, definitely go for a ½ Tbsp. of salt at most for the whole batch. Meanwhile, on another burner not so far away, I took 3¼ cups of already-prepared caramel corn and brought it to a boil with the same amounts of half-and-half, salt (which was less of an issue with the sweeter caramel corn), and sugar that I had used in the regular batch. But to enhance the rich caramel flavor, I opted to use brown sugar; you can see how that changed the color ever so slightly at this stage. I was rather worried that the sugar coating on the caramel corn would mean the popped kernels wouldn't denature properly, but that turned out not to be an issue. 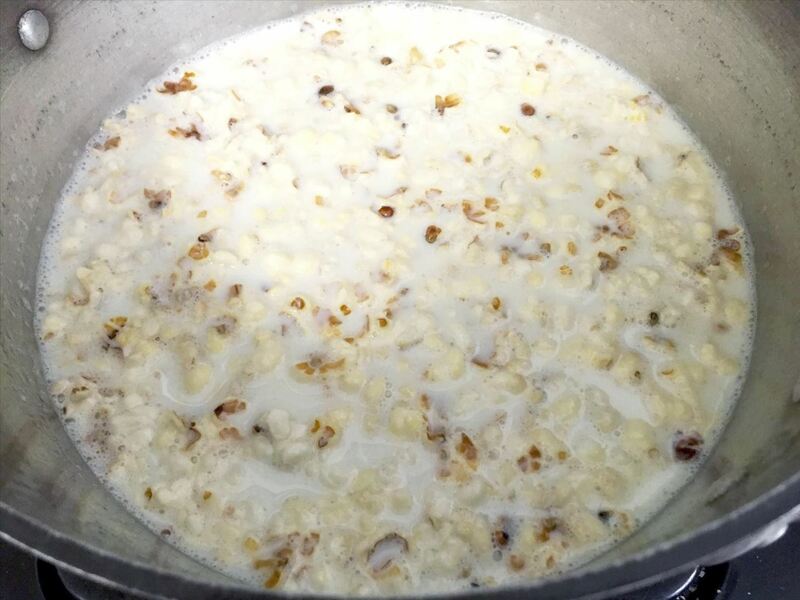 After boiling for 10 minutes, both batches of soaked corn were allowed to cool on the countertop, then placed in covered bowls in the fridge overnight. 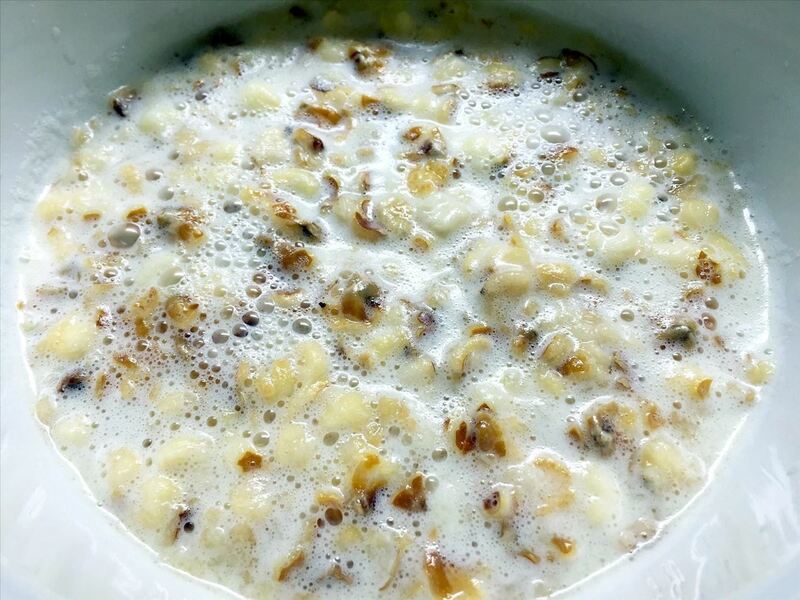 The next morning, the fluffy parts of the corn—both kinds—had pretty much turned to mush, but another interesting reaction had occurred. 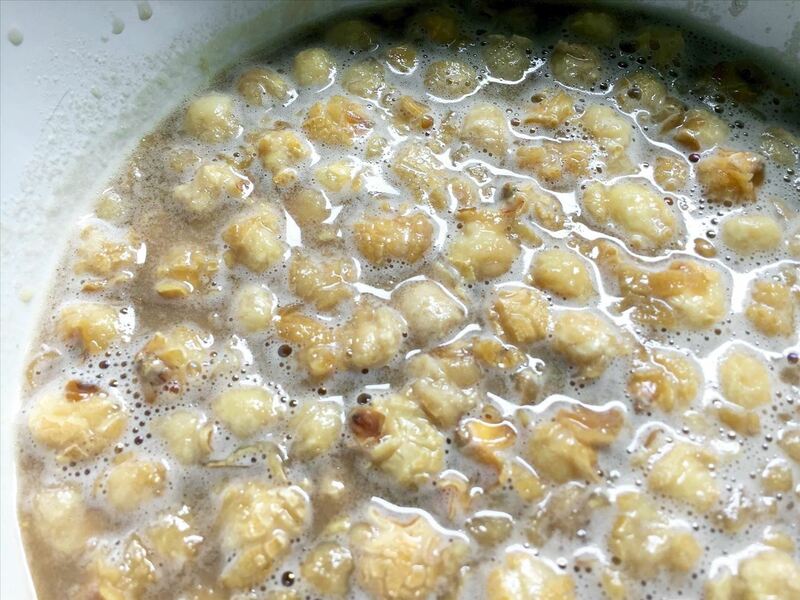 The starch from the corn and the sugar in the mixture had created a viscous layer on the top of the bowl and all around the remaining kernels of both regular and caramel popcorn. "Aha!" I thought, channeling both Bill Nye and Julia Child, "That is why it will have a milkshake-like consistency without having to freeze it!" 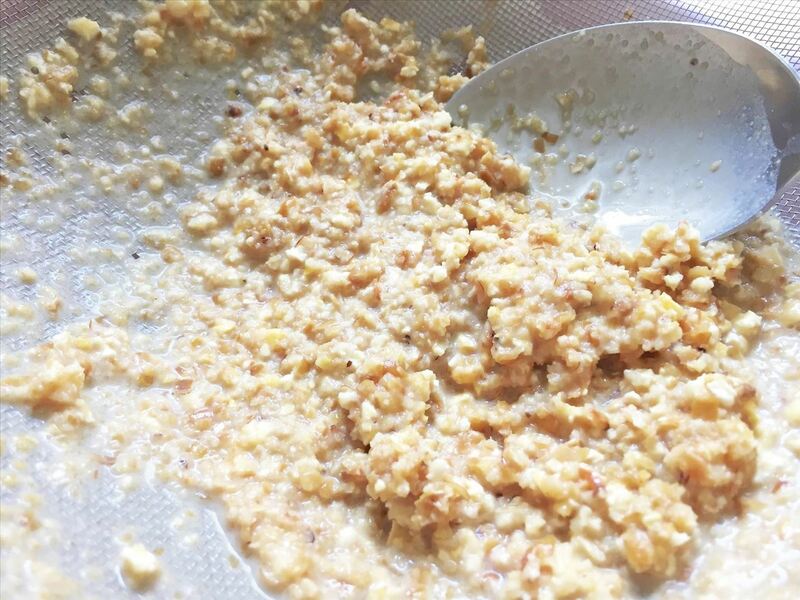 The next step in the preparation was to put the mixture in a blender, grind it up, and strain the corn mixture through a fine sieve. I am pleased to share that both shakes were absolutely delicious. The consistency was remarkably like that of a traditional, ice cream-based milkshake, and the flavor was a perfect mix of salty and sweet (my over-salting error notwithstanding). But—Sarah states at the beginning of the recipe, "Makes 6 to 8 small portions (it will be enough)"—and I have to agree. 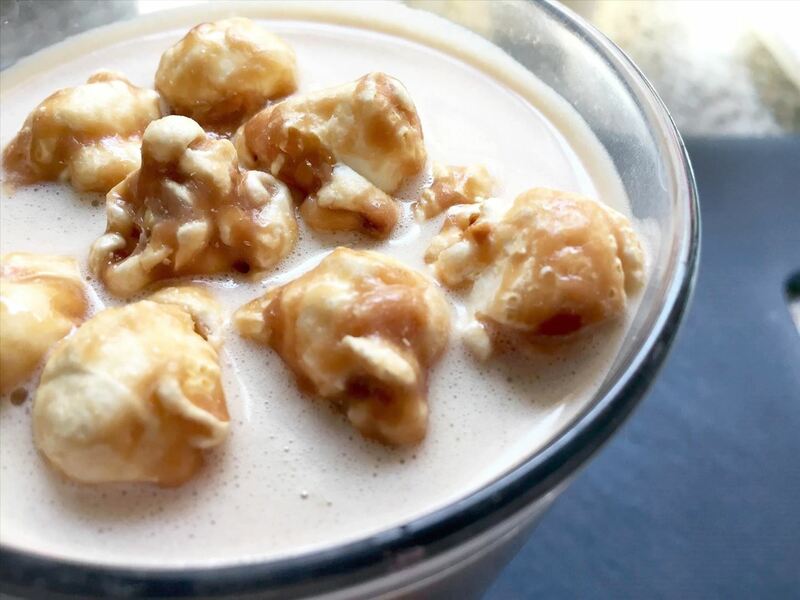 An entire glass of either the regular popcorn or caramel corn milkshake gets to be too much; I would recommend serving these in a shot glass, in fact. 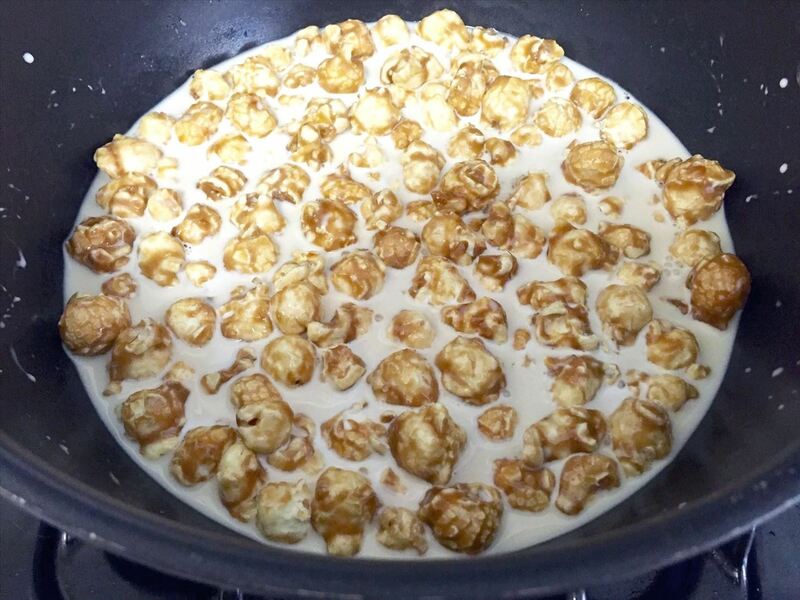 Top with a couple of whole popped corn or caramel corn kernels, and you have a delicious one-shot dessert. 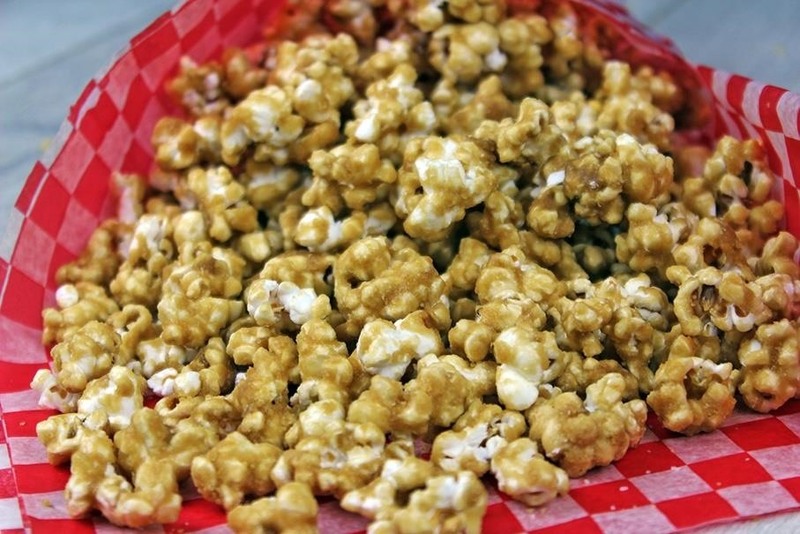 I didn't get to try it, but I wondered how this recipe might work with kettle corn, or even a chocolate-drizzled caramel corn. 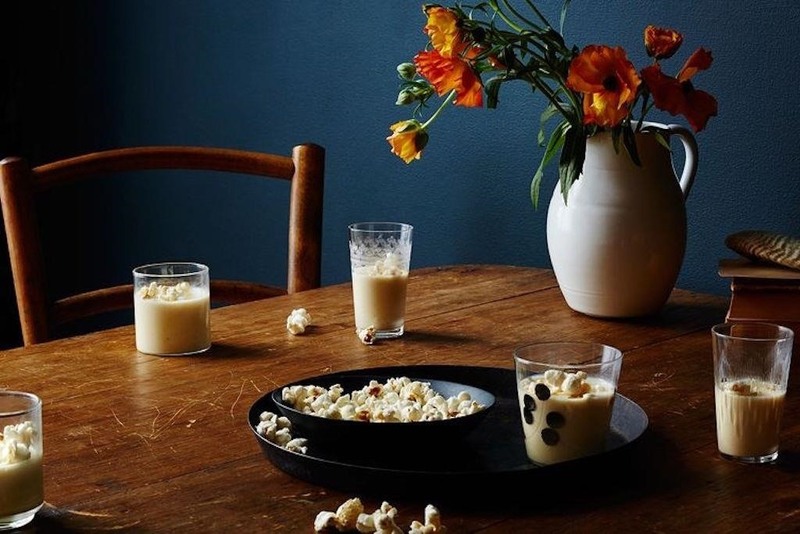 And Food52 encourages the addition of booze (bourbon or rum) to the milkshake for a sort of popcorn eggnog; I wondered how it might taste with Amaretto or Irish Cream liqueur. 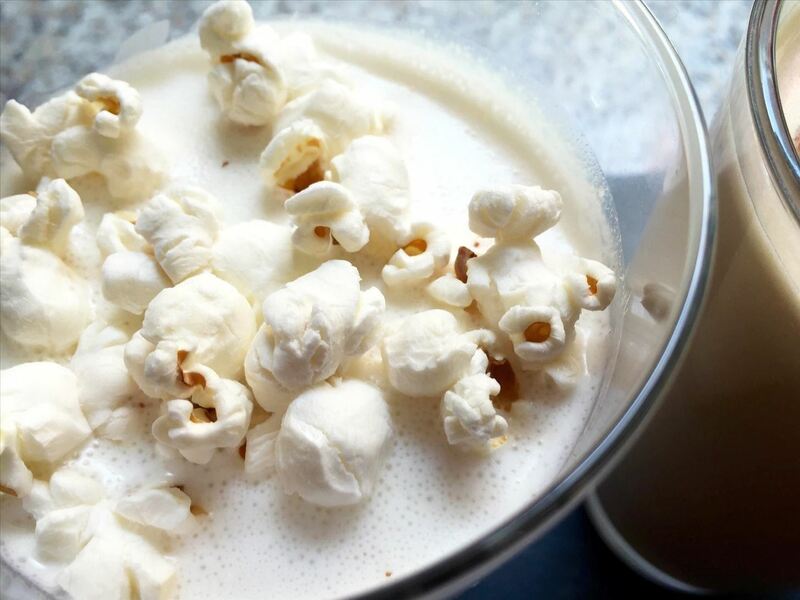 If you give any of these or your own variations of popcorn milkshake a try, let us know in the comments.